The nice thing about music: it plays such a ubiquitous role in our lives. You can benefit from it even when you’re just sitting on your hands. Even when we’re not paying attention, music is still all around us; one of the elements, a force of nature. But while music may seem magical, but it does not happen magically. Choosing music as our medium means acting with intention—channeling that great force to make lives better, and embracing everything that comes with that choice. Choosing to engage with the world through music means choosing to be open to vulnerability and uncertainty; I believe KEXP has a responsibility to model this ourselves and nurture it in others. We talk often about the unique freedom KEXP DJs have to play what they want, to express ideas through curation. But—as you can hear when you listen—there is also an underlying responsibility that goes along with this. When DJs process the news through a playlist, when artists speak openly in interviews on air, when community panels tackle weighty topics ... this is really a way of opening doors for people to think about things that can be hard to think about, and for KEXP to use our voice in a way we might not otherwise feel permitted to do. You can see this approach reflected in all the other ways we choose music as our tool to engage with the world. With the recent launch of Sound & Vision, we’ve featured artists and other voices telling broader stories through music, with interviews, commentary, insight and conversation about timely topics. In the first two episodes of this new program, artists and others have offered perspective on the relationship between music and mental illness, addiction and recovery, abuses of power in the music industry, and race and gentrification, among other topics. You can also see this in special programming days and events like Music Heals series and John Richards’ annual “Mom” show—using music to make space for grieving, grappling, healing. Or in the more day-to-day, personal interactions KEXP DJs have with listeners who need to hear a particular song in any given moment, in the spirit of celebration or solidarity or solace. KEXP listeners and supporters, along with the artists we champion, share in a collective understanding that music is not isolated from everything else in our lives. In connecting over a love of music, we have created a community with profound impact on the lives of others. I know I’m not the only one who is grateful for that community. Because you choose music, and because you choose music with KEXP, your fellow music-lovers—here in KEXP’s Seattle home and all around the world—have deeply meaningful experiences with music every single day. Your love of music inspires more love of music. And that’s a choice I think we can all get behind. Is there a memorable time in your life when music was the right choice? I'd love to hear about it. Email me any time at tom@kexp.org. I’ve had to write a lot of tributes over the past few years. It’s tempting to try to contextualize Aretha Franklin’s passing with other recent musical losses (David Bowie, Prince, Sharon Jones, Chris Cornell, Charles Bradley, and too many others) but I’d like to try and do a little more than that. Each of these artists was a great gone too soon, each possessed a voice that drew a direct line to something bigger, and each inspired the KEXP community to join together in search of an outlet for shared pain. So, yes, we’re going to talk about Aretha Franklin―because there was no one like her, no interpreter of the American songbook as skilled at wrenching the humanity out of words and melody. But really we’re going to talk about connection. At the heart of August 16th’s on-air celebration of the Queen of Soul was an emotional eight-hour marathon set by DJ Riz. Suffice to say, dry eyes were at a premium. Of the many moving responses we received from listeners, I want to mention one in particular. This listener spoke of the bond he and his sister shared through Aretha, one that connected them even when separated by thousands of miles. He described calling his sister and asking her to stream KEXP so they could dance together and celebrate the singer’s life and her gifts. They danced, they cried, they connected. That’s what happens when music works its unique magic. Distance is no match for the art form’s power to connect us, not when it features a voice as rife with passion, pain, and hope as Aretha’s. Sometimes losing something profound, like an artist whose very name is synonymous with soul music, forces us to look inside and reconsider what is most important. In the case of the listener above, it was his sister. For you, it might be a child, a best friend, a spouse. The listener closed by thanking Riz and everyone who makes this kind of programming possible. In truth, he was thanking you. It’s because of the support of you and your fellow donors that KEXP is able to facilitate these kinds of exchanges. We can be there for you because you are here for us. It’s as simple as that. We may be separated by miles, years, even conflict, but music maintains a special ability to cut through any divide. A song can remind us of a loved one we need to call or a bridge we need to rebuild. In fact, when Aretha’s voice wraps itself extraordinarily around Paul Simon’s lyrics in her version of “Bridge over Troubled Water” the lyrics take on an added dimension. This is what you power when you give to KEXP: donors supporting other listeners, making it possible for more people to experience the benefits of music. 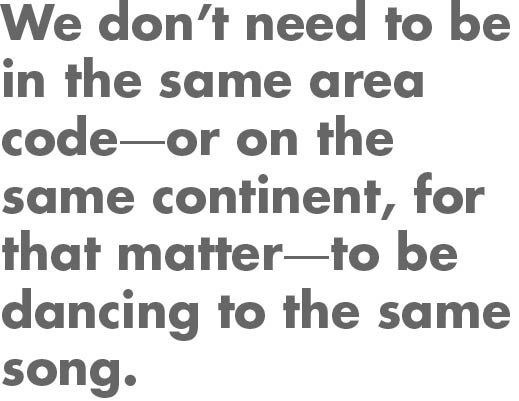 We don’t need to be in the same area code―or on the same continent, for that matter―to be dancing to the same song. For another chance to experience the power of Aretha’s voice, I encourage you to watch this performance. If you'd like to share the story of a connection you’ve made through music, please email me: tom@kexp.org. I think of 2017 as an extraordinary year for all of us, one filled with profound changes and contradictions. People made their voices heard as they spoke out against injustice and in support of human rights, in numbers we haven’t witnessed in decades. As always, music maintained an essential role in social change, providing both encouragement and relief. You let us know how events were affecting you and together we navigated the challenges. At KEXP, we’ve continued to pursue our organizational mission while adapting to a shifting landscape that has left many members of our community disillusioned yet impassioned. We believe more strongly than ever in the power of music to make lives better. One way to really grasp the positive effects of music is to watch individuals share in the listening experience. On January 20th, 2017 during our Bed-In For Peace I saw a Gathering Space full of people singing in unison, in their own unique voices. It was a powerful moment, one that caused me to step back and reflect on the power of music to bring us together. Every day, I am moved by what your gift makes possible at KEXP and the ways you help us grow. In 2017, audience members of all ages danced to Preservation Hall Jazz Band, emerging musicians experiencing mentorship from industry professionals, community members gathered spontaneously to grieve and celebrate a local musician, listeners shared heartfelt stories during our Music Heals programming—these are all examples of what you’ve built. I know we are moving forward. I know this because I can look back just a few years and see how far you’ve taken us. Thank you. With your help, we’ll continue to push in new directions we haven’t yet imagined. In musical terms, sustain is the length of time a guitarist, vocalist, or other instrumentalist holds out a note before it becomes inaudible. For an arts nonprofit like KEXP, the word “sustaining” refers to supporting an organization on a recurring basis, for the long haul. In the classic mockumentary This is Spinal Tap, guitarist Nigel Tufnel, played with wonderful cluelessness by Christopher Guest, was a little confused about how amplifiers actually work. Still, Nigel provided us with a useful metaphor: turning it up to “eleven.” At KEXP, we’re not talking about volume, however, we’re measuring impact. So, what does “eleven” mean? It means music playing a larger, more meaningful role in people's lives, artists touching broader audiences, the music entrepreneurs of tomorrow getting access to the resources they need. Eleven means reaching past what we might’ve thought possible before. Together. KEXP introduced its Amplifiers giving club in 2010, so to arrive at a point when we have 10,000 sustaining donors is an extraordinary milestone. The name was no accident. By definition, an “amplifier” enlarges the reach of the sound it pushes out. You turn up the voltage of what we do. While that number is dramatic, what I find so profoundly moving is the thought that, every month, each of these individuals is actively committing to sharing music's life-enhancing qualities with others. Our community of Amplifiers possesses its own collective electricity that powers what you hear on-air, see in the Gathering Space and YouTube, or read on KEXP.ORG. The influence of our Amplifiers can’t be overstated. The chances we get to take with our Music Heals series, as well as educational programs like Mastering the Hustle and Audioasis Youth Initiative are a direct result of these committed donors. In 2013, Amplifiers even helped KEXP make a major shift in our fundraising, when we instituted the One-Day Summer Drive in place of the previous week-long version. This Friday marks the beginning of Amplifiers Love Week, a yearly tradition celebrating these special donors and the monumental effect they have on KEXP. All week, you’ll hear testimonials from individuals who choose to champion music in this sustained manner alongside appreciative shoutouts from our DJs. Inspiration, a source of strength, vital nourishment—music provides all of these things. It can help us aspire to become better versions of ourselves, even prompt us to help another person. Amplifiers exemplify the belief that art can change lives. It all comes back to the personal commitment behind the giving. You choose to become a member of this music-loving community of donors, each of us essential to KEXP’s ability to keep music in people's lives. We all participate in the best way we can—as an Amplifier, a VIP club member, a volunteer, a listener sharing a new song with a friend. Collectively we power this amazing community. Thank you for helping amplify what KEXP can achieve. If you have a question about Amplifiers Love Week or This is Spinal Tap, feel free to reach out to me at: tom@kexp.org. As KEXP has evolved, we’ve seen the role of our DJs grow right along with us. In those early days, I was fortunate to witness how 40-plus DJs would challenge, explore, and champion artists from a tiny booth in the University of Washington Communications building. That early organic, raw approach evolved into a philosophy, which grew into an organizational mission: to enrich your life through music discovery. As we’ve grown, we’ve become more intentional in upholding the institution of the curating DJ. It’s a powerful and beautiful thing our DJs do every day. They engage, react, and respond, creating a soundtrack to our lives in real time. They tell stories through the mix, harnessing the emotional power of music and art to build a vibrant community. It all works toward helping make the world a smaller, more connected place. The power of human curation. People sharing music with people, choosing songs from their hearts and experiences to surprise, comfort, move, even occasionally provoke. We do that by encouraging our DJs—and by extension, our organization—to stay engaged with the world. There is no playlist that can replace the enthusiasm, subtlety, and sense of purpose one music lover demonstrates when sharing their passions and findings with another. You can find the DJ in our mission statement. They are adventurous explorers, guiding us through music discovery. It’s more than simply a breadth of knowledge and passion for music—what makes the KEXP listening experience enriching is the authentic ongoing dialogue between listeners and DJs. Hour by hour. Day after day. When Morning Show listeners reached out to John Richards to share how inspired they were by the young activists from Parkland organizing on behalf of their fallen classmates, he was able to weave song suggestions, lyrics, and themes of youth empowerment into an uplifting and engaging set of music. Human curation also means that Kevin, for example, can take an event in history—artistic, political, or social—and use music to give it context, along the way helping us understand or feel a song or artist in a new way. Artist. DJ. Listener. All connected by music and by choice. Then there are DJs modeling and encouraging empathy through their curatorial decisions. We hear it when DJ Chilly makes the choice to showcase the music of Puerto Rico and Mexico in direct response to natural disasters in those regions. Music can connect us and provide a sense of respite when events are out of our control. We’ll keep doing what we do: curating, crafting, and delivering the best audio, visual, and storytelling we can every day. We ask that you let us know what’s happening in your homes, in your countries, in your community, in your schools. We also hope music will increasingly connect us, encouraging and enabling a coming-together despite our many points of view. That’s how we can keep this conversation going far into the future. Ultimately, we approach our work in this way because we believe music can make your life better. And we are able to sustain the work because a global community of donors, artists, volunteers, and listeners believes that too. If you’d like to talk to me about human curation and the important role music plays in fostering tomorrow’s leadership please reach out to: tom@kexp.org. What hasn’t Paula done? She was chief council of Starbucks—handling everything from music rights to fair trade coffee, she's jumped out of planes, she was a member of the White House council during the Iran-Contra hearings. The first time I met Paula was when she and Randee came for a tour of our old home at Dexter and Denny. We sat down and had a coffee in the conference room. That conversation was about the importance of music, the role it plays in our lives, and seeing KEXP as a platform for her to play a role for serving the community. When I later asked her about joining our board, the way she said the word "yes" floated me. It was a joyful yes. That's the effect Paula has on people and the effect she’s had on our organization. It's positivity married to commitment married to wisdom. Paula is both a doer and a giver. Paula is a positive force not just in terms of community but in terms of engineering her own life. After her incredible achievements in the business world, she retired relatively early to light up a path as a singer-songwriter. I can't think of anyone with the strength, positivity, passion, and dedication all funneled into making this decision. Recently, Mary and I went to see Paul play at the Muse up in Conway. It was an intimate crowd witnessing the concentration of talent up there, elbow to elbow, onstage. It was large band including banjo, Tor Dietrichson on congas, and Paula, expressing and singing with sustained joy. And Randee has been there the whole time, supporting Paula and the organization throughout the capital campaign and her work on the board, even hosting a concert in their home with the Cave Singers. You combine the two of them and you've got some nuclear fusion going on. Paula’s friendship is immensely important to me personally. I will also never forget her mentorship, those pearls of wisdom she offered me from time to time from her wealth of experience. I’ll leave you with this unscripted moment from the stage at our New Home Ground Breaking on January 28th, 2015. Spontaneously, Paula shouted, “Yay KEXP!” Today we say, Yay, Paula! I want to discuss why music matters so much to us. Music gives us hope. It helps us get through. Music brings people together and inspires change. All of these notions came together a few weeks ago when Mary and I attended the 2017 SMooCH fundraiser. I wish you all could have been with us at The Showbox that night. The lineup featured KEXP-favorites from across the stylistic spectrum: Phantogram, Built to SpillTacocat, and Dirty Bomb. Once again, in partnership with the Nordstrom family and Sub Pop, we saw our music community come together to raise more than $3.5 million dollars this year to fund uncompensated care at Seattle Children’s Hospital. With that cause in mind, it seems especially appropriate that Issaquah’s School of Rock kicked off the evening. During the course of their set, I witnessed roughly a dozen young folks come together to express themselves and demonstrate their mastery of music performance. Yes, School of Rock captured the room from the first power chord, but their performance was powerful on other levels as well. More than just their undeniable charisma and polished stage show, the kids’ performance was a reminder of music’s ability to transform how we feel about ourselves. As David Byrne and Kate Tempest told us when they visited our studios, young people can use music to create an identity and find a place for themselves. This is especially important during tumultuous times. Some of these young players might be the headliners of 2020 or 2025 and—thanks to your support—KEXP will be there to play them. It’s a role we take seriously. Nurturing and championing artists is what we aim to achieve every day. A philanthropic event like SMooCH reaffirms music’s profound ability to help us look for the best in ourselves and each other. I would love to hear from you about your relationship to music, the role it plays in your life. Feel free to reach out to me at: tom@kexp.org. 2016 wasn’t always easy. We experienced laughter and profound loss, thrilling accomplishments and new challenges. KEXP entered a new phase in the organization’s history, and with it came new responsibilities. It was a year of dramatic contrasts. While KEXP celebrated hard-won achievements, we watched our musical and civic communities suffer disheartening blows. Through it all, music helped us navigate both the delight and despair. April 16th, we celebrated your contributions to KEXP’s new home during our Grand Opening celebration. It was a high point in the organization's history: a mammoth event with performances by Sharon Jones & the Dap-Kings, Strand of Oaks, Bob Mould, Deep Sea Diver, and so many others. Throughout the day, more than 12,000 people walked through KEXP’s still-pristine new home for the first time. The day was a celebration of what our community can accomplish together and an indicator of things to come. A few moments from that day clearly stand out in my memory. Mary and I shed tears as Grace Love, armed with a single microphone, hypnotized the room with an a capella version of Leonard Cohen’s “Hallelujah.” I also had the career highlight of introducing the crowd to Cliff Noonan, and Brent Wilcox, who along with Victoria Fiedler and John Kean, constitute the core founders of KCMU. But even during times of celebration, there were sobering moments. At the unveiling of the donor tiles at our New Home, several groups sat quietly, taking in a tile for someone they’d lost. 2016 will forever be marked as the year we lost some of our most iconic artists including David Bowie, Prince, Leonard Cohen, and the beloved Sharon Jones. We certainly hadn’t anticipated how the Gathering Space would become a place to congregate and grieve together so often. Music connects us. This report is for donors like you who kept that idea in your head, the feeling in your heart, and then pulled it all into the real world with your gift. With your passion powering it all, we continue building on what this music community has done over the past decades. We remain committed to pursuing curatorial excellence. At the same time, we are expanding our service to the community with programs like the Audioasis Youth Initiative, and worldwide, with music discovery projects like our trip to Trans Musicales. Last year, you made it possible for KEXP to present unique and powerful programming like our most successful International Clash Day to date, a day-long breakdown of De La Soul’s Three Feet High and Rising, KEXP’s first-ever Record Fair, the kickoff of our music and literature series, and so much more. But it’s not always about the new and flashy. Your gift also powers the overnight DJs who are with you on your drive to the airport, and the admin staff who crunch the numbers. Each day here in our Gathering Space, I see parents with their sixteen year olds, freelancers working on their next projects, music lovers lining up for in-studios, preschoolers in capes marching together through the courtyard. And you made all of that possible, too. Everything in this report is a direct result of your support, as well as that of your fellow donors. We wouldn’t be here without you, and it is you who keeps us thinking about the future and where we can go from here. Count on us to continue working to expand and deepen the role music plays in your life and in our community, both globally and locally. Here’s to a new era of music and connection!